Ruben Alonzo’s English learners in his Texas classroom were thriving. He believed in their potential the same way a teacher had once believed in him — a third-generation migrant worker who went on to MIT, Harvard, and Columbia University. His students were two miles from the Mexican border in Rio Grande, at an independent charter school in the IDEA Public Schools network. Many were not proficient in English, but 98 percent passed their state algebra tests. “That tells you that regardless of their English proficiency in the areas of math and science, our English learner students can succeed,” Alonzo said. Because his life’s passion was to help students with similar backgrounds as his own, Alonzo’s wife, Cynthia, a California native, challenged him to bring his vision to even more students, where historically schools have been failing them. In August, Alonzo will open Excelencia Charter Academy. The independent charter elementary school will start with 120 seats for transitional kindergarten through first grade, with an innovative teaching model for English learners. It will grow to serve grades TK through eighth grade. Alonzo said his vision for Excelencia grew out of his own experience, working hard in the Texas fields during summers and excelling in school the rest of the year. His father died when he was only 12 years old, and his brother was incarcerated a couple years later. “I was an 18-year-old boy, with limited options, whose brother was in prison, whose father passed away, living in poverty, but this one teacher had such a high bar of excellence for me,” Alonzo said. “Excelencia takes that message and that vision that my calculus teacher gave me, and now I want to share it with my students — 4-years-olds, 5-year-olds. When they’re going into first grade, I want them to have that vision that they are going to college, surrounded by adults in school that know that’s the goal,” Alonzo said. 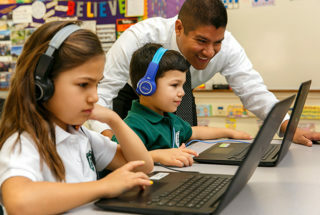 Excelencia will offer a unique “regrouping” model where students, even in the earliest grades, are taught by teachers in different specialties, like in high schools. The two-teacher program is tailored to support English learners. What’s innovative about Excelencia’s teaching model is that teachers for even the youngest learners will be able to specialize in what they’re best at, said Alonzo, who honed his model the year before Excelencia’s charter was approved, during a Building Excellent Schools (BES) training program in urban charter school creation and leadership. But while his academic vision was crystal clear, Alonzo knew that opening his school on an under-enrolled LA Unified campus wouldn’t be easy to navigate. State law requires school districts to offer unused space to charter schools, but the process is fraught with conflict and called broken by charter leaders and district officials alike. He applied to be sited in East Los Angeles, where he had approached nearly a thousand families, ending up with a list of 175 families who intended to enroll. He lost many of them in February when LA Unified designated classroom space for Excelencia at Sunrise Elementary in Boyle Heights. Most charter schools don’t get their first choice when seeking space on a traditional school campus, said Ebony Wheaton, director of facilities in Los Angeles for the California Charter Schools Association. And there’s no transparency about how LA Unified determines which schools to offer, she said. When charters make their requests, “they do it blindly,” without knowing if a school is at capacity or how many unused rooms it has. However, the district and the charter community are moving toward more cooperation. A resolution passed last Tuesday sets up a working group that brings together district, charter, and community representatives to address issues of mutual concern, including the co-location process. It also allows the school board to vote on policy changes to the charter renewal process. Two days later, the charter association dropped two lawsuits it had filed against LA Unified regarding its co-location process. Alonzo said the distance between where he hoped to be sited in East LA and the Boyle Heights location is only 2 to 3 miles, but for many families that was enough to look for other options. Some families have enrolled their children at Excelencia despite the new location. Others turned to Excelencia when they didn’t get into other high-performing schools. That was the case for Freddy Terrazas. He and his wife had hoped their son could attend KIPP Promesa, but he was placed on a waiting list of 175 students. In the lottery, his son was number 60, and Terrazas gave up hope of getting in. As of last month, the six KIPP LA schools in East Los Angeles had 1,461 students on waiting lists. When he met Alonzo and learned Excelencia would be opening next door to his Boyle Heights workplace, he felt it was the perfect match. His son is at a private preschool, and they wanted him to receive a good education at a school with a full-day schedule. 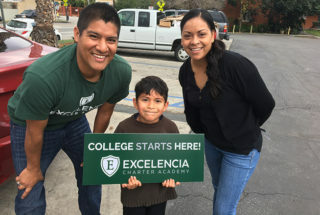 Excelencia “offers a full-day program that works perfectly for me and my wife as we were already worried about him attending a half-day kindergarten program and finding someone to pick him up,” Terrazas said. Last year, 26 percent of Sunrise students were proficient in English, compared with 40 percent districtwide. In math, 28 percent were proficient, compared with 30 percent in the district. 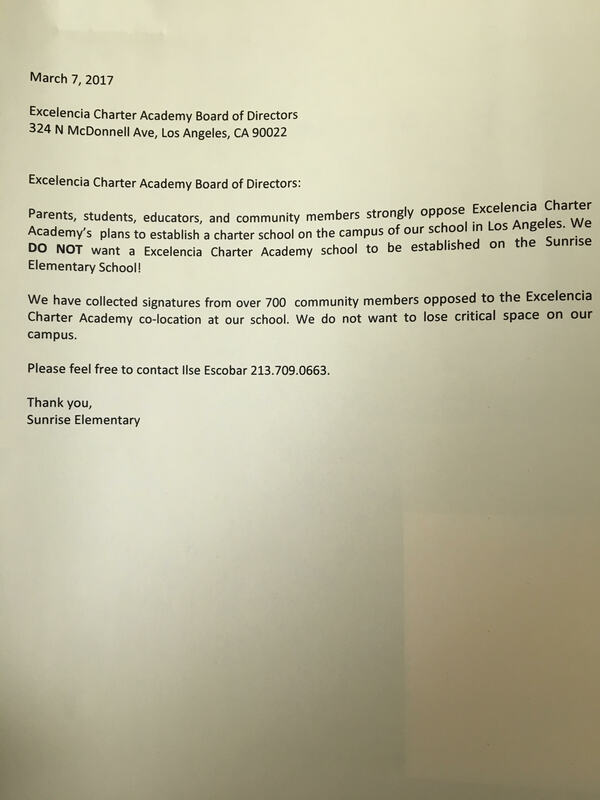 Like many other charters seeking space on district campuses, Excelencia has been targeted by protests by the teachers union, United Teachers Los Angeles, or UTLA. Many charter school faculties are not unionized. Expressing their concern to Alonzo, some parents have told him that a petition circulating in the community reads, “Sunrise Elementary is in danger! Say no to losing 7 classrooms next school year,” in both English and Spanish. And rumors have spread that Sunrise is at full capacity and therefore Excelencia shouldn’t be allowed there. The enrollment at Sunrise has dropped from 519 students in the 2010-11 school year to 430 students last year, according to California Department of Education data. 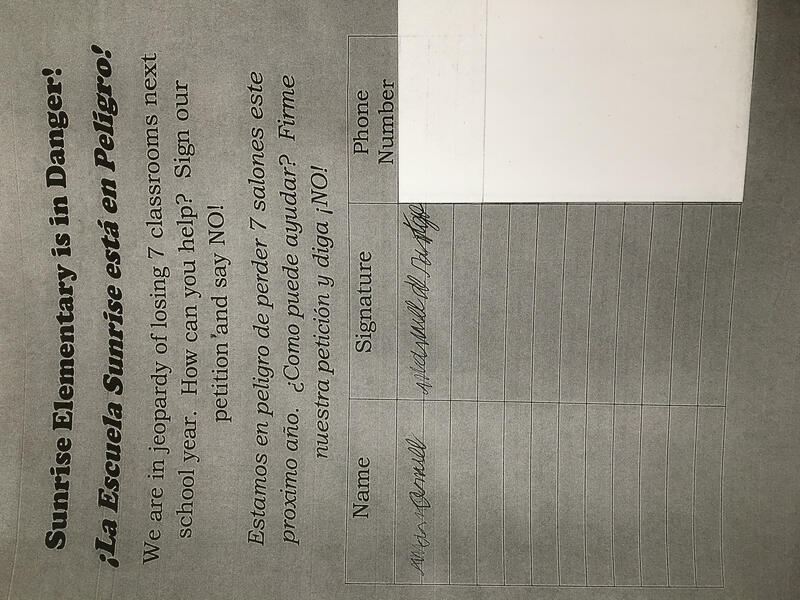 The Excelencia board in a public meeting received a letter this month saying members of the Sunrise school community “strongly oppose” the co-location because the school will “lose critical space.” The letter, which states that 700 signatures had been collected, was signed “Sunrise Elementary,” but the contact information is for Ilse Escobar. Escobar confirmed in a phone call that she is not a Sunrise parent but is a UTLA community organizer — information that was not indicated in the letter. A UTLA video shows one of its protests at the school against Excelencia. “I anticipated some struggles before opening the school, but I never anticipated false information given to parents in the community,” Alonzo said. But Alonzo says he’s undaunted. He has a vision in mind, to be a bright spot of success for English learners in Los Angeles, and so he is carrying on. 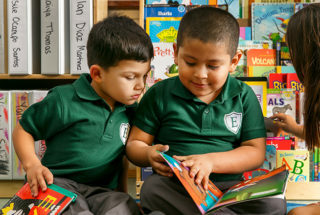 Excelencia will become the third charter elementary school in Boyle Heights. Enrollment grew by 20 percent — or 117 students — at the two charters from 2014 to 2017, while the eight district elementaries lost 329 students, or 7 percent of total enrollment of 4,330, according to data from the California Charter Schools Association. In the 10 neighborhoods GPSN identified as having the least access to high-quality schools, fewer than 20 percent of students were on grade level. “South LA remains the area with the highest need, and East LA comes next,” including Boyle Heights, Castrejón said. Alonzo has until May 1 to accept LA Unified’s offer of space at Sunrise Elementary. After that date he will have the opportunity to meet the school’s administration, with whom he is expecting to have a partnership. “We’re looking forward to partnering with Sunrise and other schools in the area,” he said. Alonzo now believes the Sunrise campus is where he wants to start building a path for his young students toward academic excellence. “A school building will not define the kind of education we want to offer. You can be at a multimillion-dollar building or be co-located, but that doesn’t define the leadership, the staff, the vision of the kind of education we want to offer,” he said. Excelencia will host a community meeting at 5 p.m. on April 12 at the Estrada Courts Boys and Girls Club for families to learn more about the school, ask questions, or enroll. More information is available here. *This article has been updated to correct that the school will expand to eighth grade instead of fifth grade and that students will not rotate classrooms under the school’s model.